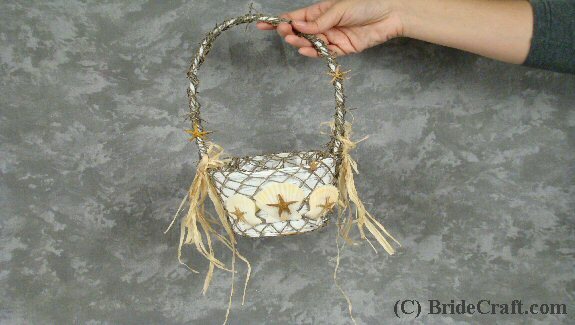 Craft a Beach Basket for Your Flower Girl! Looking for ways to tie your beach themed wedding into every detail of your décor? 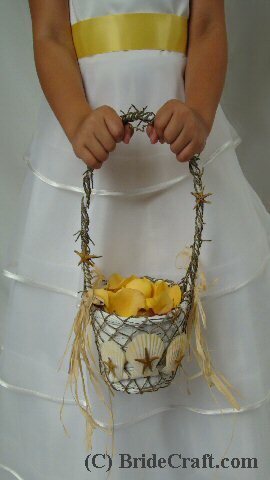 Want to know how to make a beach themed flower girl basket just like this one? Then you're in the right place! Below you will find a step by step tutorial showing you how to do just that. Pros: Perfect for you gals who love the simplicity of hot glue and fairly inexpensive for something so custom. Of course it can be made months in advance, and can be edited to match your theme even more. Cons: Careful with that hot glue! If you’re not handy with it, you will singe your finger tips. A rambunctious flower girl could rotationally knock all of the shell details off the basket if they are not properly secured. 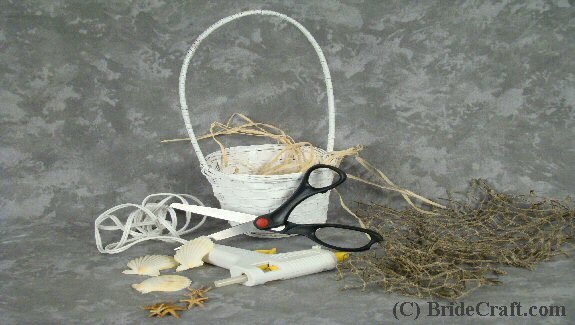 Step 1: You will need a small wicker basket, beach netting, raffia, at least 3 shells, at least 5 star fish, scissors, hot glue gun and glue sticks. 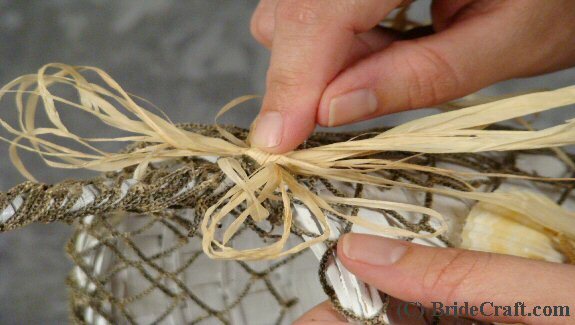 Step 2: Cut enough netting to cover the base of the beach basket. 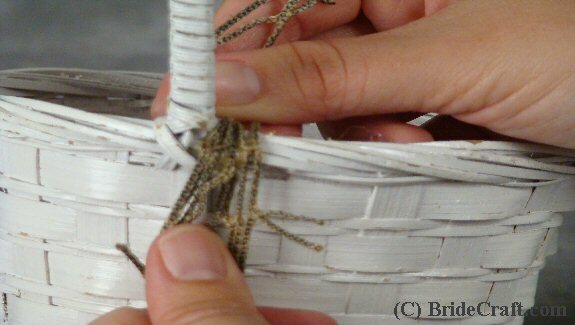 Also cut a longer, thinner strip to wrap the handle of the basket. Step 3: Begin by putting a thick dab of glue at the edge of one of the handles. 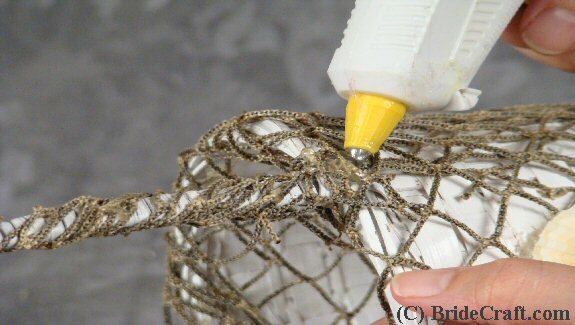 Step 4: Firmly press a piece of netting into the glue and let dry. 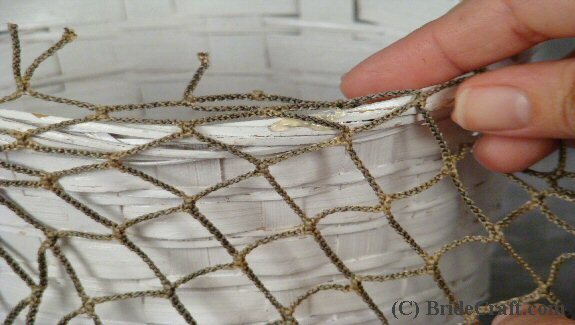 Step 5: Dab thin points of glue around the rim of the basket and proceed to press the netting over it. Let cool. Step 6: You should have something like this. Tip: Glue the bottom, to! 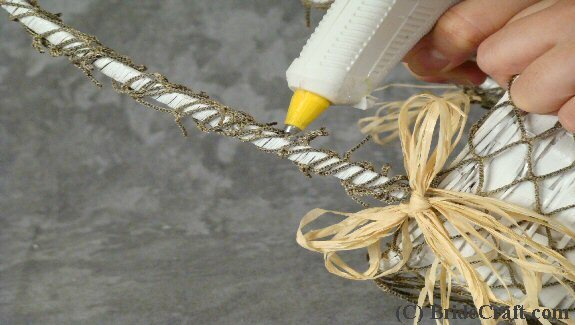 Hide ragged edges by securing them to the bottom with glue. Step 7: On the inside of the handle base, put a thick dab of glue. 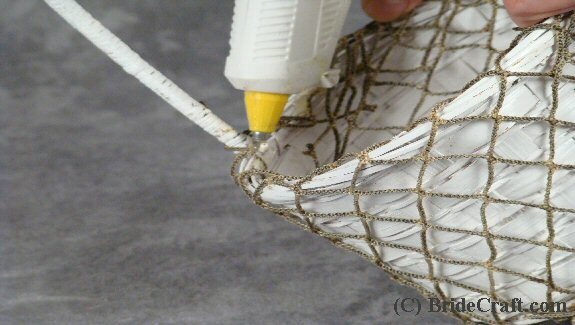 Step 8: Take your thin piece of net and press it firmly into the glue. 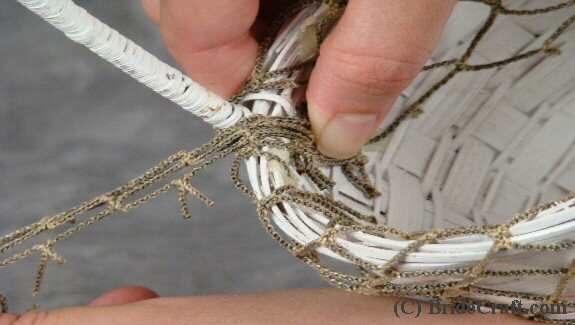 Step 9: Wind the netting around the basket handle until you are satisfied with its appearance. Secure at the base with glue. 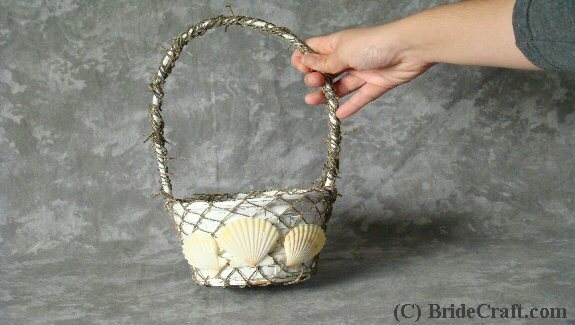 Step 10: Take your sea shells and position them against the basket. When you are satisfied, glue them into place. Tip: This part is trickier then it seems. 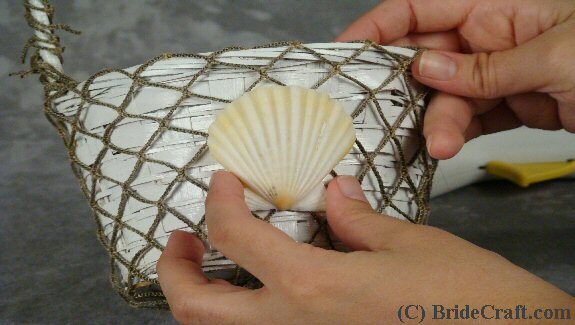 Use lots of glue and make sure you glue the edges of the shell well, or they WILL fall off. 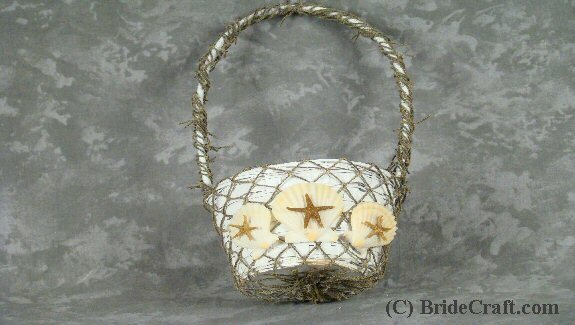 Step 12: Since the basket is still in obvious need of embellishment, take your star fish and affix them to the center of each shell with the hot glue. 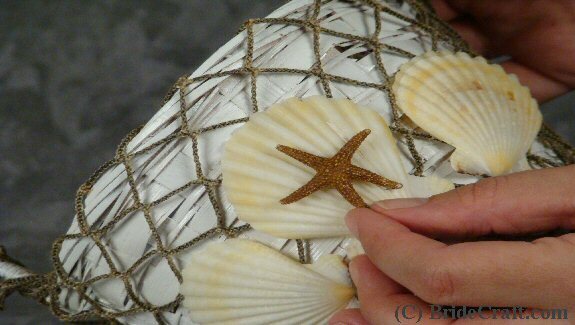 Step 13: The star fish help to dress the shells up. Still simple, but not as plain. 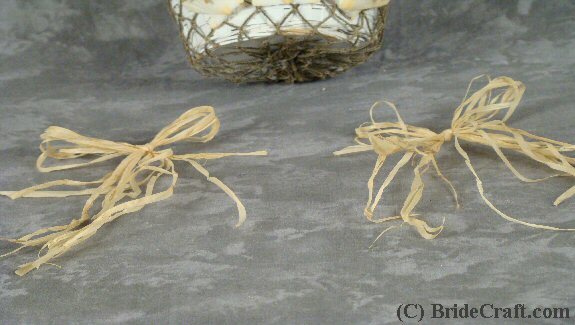 Step 14: Use your raffia to create to easy shoe string bows. 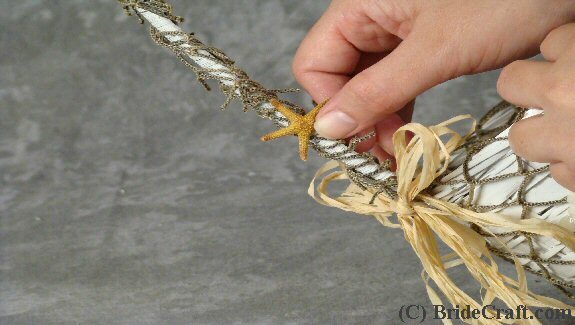 Tip: Use at least three pieces of raffia to create each bow. 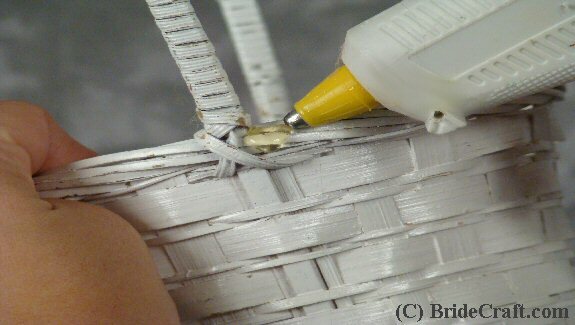 Step 15: Dab glue on the side of the basket at the base of the handle. Step 16: Quickly press the bow into the glue. Make sure it is the way you want it before the glue dries. Step 17: You should have something like this now. Step 18: At different levels of the handle, place dab of glue. Step 19: Secure a star fish to the glue. Tip: Do this on the opposite side. But do it higher or lower…don’t line them up. And make sure they are secure. Think of those little hands! 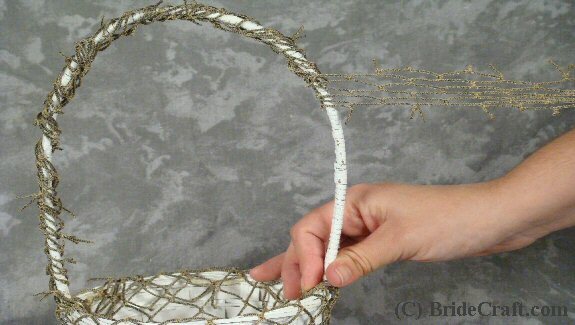 Step 20: Store your Beach Basket in a safe place until it’s time to entrust it to your flower girl!